Comprehensive care and artificial intelligence changing the way of treating diabetes – aim to reduce significantly complications and costs. Quattro Folia is announcing that their newest version of Balansio® service is now launched and provides intelligent tools for diabetes treatment. Since 2015, when Quattro Folia launched its first Balansio version, the work has continued by taking even bigger steps toward changing the way how people with diabetes are treated and supported. 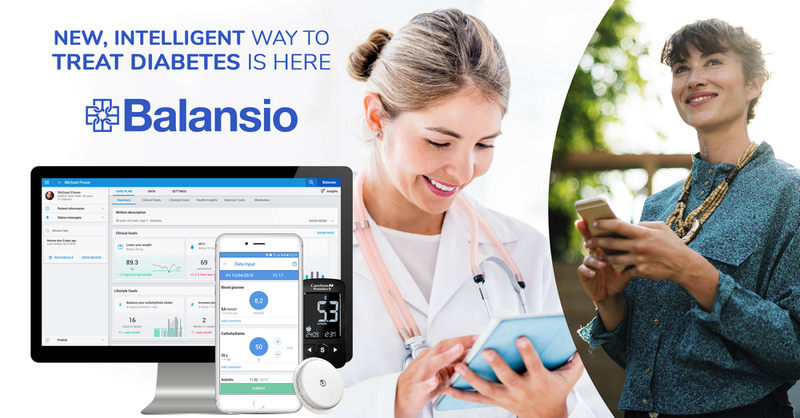 Balansio is designed to enable clinics and healthcare professionals to extend their clinical service beyond appointments and to help the diabetics in their daily struggles with the condition. “At the moment diabetes treatment is based on calendar-driven appointments couple of times a year, even though the diabetes is actually treated in the everyday life. The knowledge of people with diabetes and their chances and possible means to take care of their diabetes, as well as the motivation for lifestyle choices define the outcomes of the treatment and risk of diabetes related complications. It is well known that the existing diabetes treatment model is not meeting the needs for support and guidance in everyday life to provide needed care and to prevent the complications.”, comments Markku Saraheimo, MD, DMSC, Specialist of Internal Medicine and Diabetology and researcher at the University of Helsinki, Finland. With full visibility of the self-care data, timely help, right tools and continuous support, diabetics can achieve better care balance resulting lower risk of complications and more enjoyable daily life. By concentrating on preventative diabetes care the biggest amount of diabetes care costs (complication related costs), could be reduced by half, which would be a big help with recourse problems in the healthcare. With the help of medical advisors and diabetics, the development team was thinking solutions to various problems which diabetics and the clinicians are confronting. Difficulties to achieve good care balance comes from the lack of support, lack of visibility to the progress and the lack of understanding of affecting factors in the treatment. The lack of support is a result from resource problems, sofore clinicians time should be spend more efficient and some of routines should be automated. With help of artificial intelligence it is possible to find the patterns in the care and show the problems timely, so the needed help to understand diabetes better is always available. To motivate the diabetics they have to understand how to treat themself in the everyday life, see the results and get some feedback and encouragement instead of continuous feeling of failing. There are so many factors which affect diabetes care. It is not enough to follow blood glucose values and possibly medications. That is where we come to Balansio’s uniqueness, which is comprehensive diabetes care. Balansio collects data widely and takes into account different aspects of care, which are important for clinicians to provide the needed care and guidance. Balansio enables the clinician to provide care and support based on patient’s needs, the clinical intelligence brings timely support in everyday life situations for the diabetics. Based on the intelligence, Balansio Assistans identify different problem areas in patient data and provide observations of the possible causes and considerations for corrective actions both for the individual and the clinician. To resolve the resource problem Balansio provides for clinicians the summary of the needed information, points out the special attention needed areas and organizes the patients according to they need of care. Balansio is also only service in the world, which enables each clinic to modify the clinical intelligence according to they procedures and needs. It helps individuals to achieve their goals by motivating them and keeping them up with careplan progress. Balansio provides visibility to their HbA1c levels daily so they can see the progress of lowering their risks for complications. Balansio’s bolus calculator makes bolus using easier and more correct, which helps also to achieve better care results. Balansio connects to the most popular blood glucose meters as CareSens N, CareSens N Premier, CareSens Dual, Alpacheck Professional, Contour Next One and TEE2+. Balansio is authorized by Abbott to receive data from FreeStyle Libre in Finland. Balansio collects daily activity data from Google Fit and iOS Health and makes manual input easy of the taken medications, eaten carbohydrates, weight and intense training. Balansio’s new version for the individuals is now available for free in the App Store (iOS) and Google Play (Android). New version of Balansio PRO is available on the web browser and have been updated automatically for the clinics, new orders can be placed by contacting Quattro Folia. Quattro Folia is a Finland based software startup company focusing on developing professional healthcare technology and related digital services. Company’s mission from the beginning has been to re-think the treatment of chronic diseases by utilizing digital technology. The realization of that mission is Balansio service, which puts the diabetic into the driver seat and enables professional care team to provide timely support and coaching as needed with the help of automation and clinical algorithms.